When it comes to gorgeous antique lamps, there are three that really stand out: Tiffany, Pairpoint, and Handel. With beautiful glass shades and intriguing bases, these are avidly sought by collectors and relished finds for high end antique dealers and auctioneers. Learn more about each of these renowned lamp makers and see more examples by clicking on the links below. When the name Tiffany comes up in conversation, jewelry most often comes to mind since that’s what is primarily stocked today in their modern boutiques. But Tiffany Glass and Decorating Company was making leaded glass objects, not only lamps but windows as well, in the late 1890s. Tiffany displayed his leaded-glass lamps at an 1899 exhibition of his works in London. This was the first time they had been displayed publicly. As a testament to the beauty and quality of his leaded glass, he won the grand prix at the Exposition Universelle Internationale in Paris in 1900 when he presented his Four Seasons window crafted of leaded-glass. 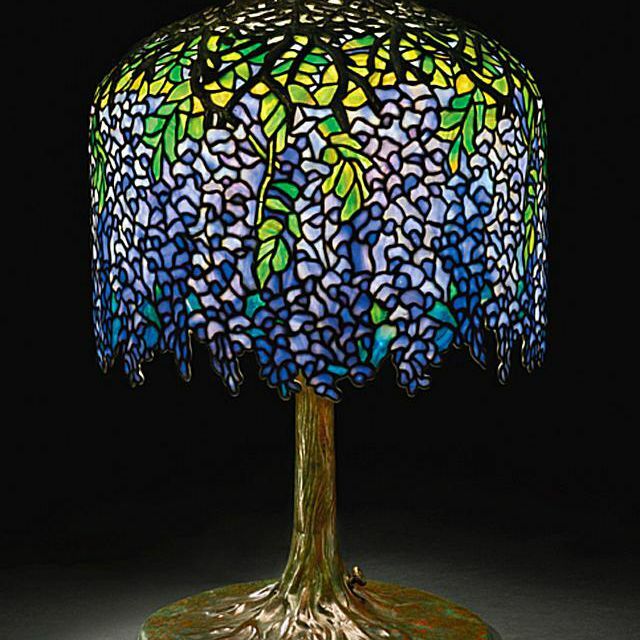 Today Tiffany leaded-glass lamps range in value today from the tens of thousands to over one million dollars. In fact, the “Wisteria” example shown here sold at Sotheby’s in 2013 for an incredible $1.56 million. Even good Tiffany reproduction lamps made in the 1960s can sell for thousands. For more affordable options, collectors look to Tiffany desk lamps with far less elaborate shades. Pairpoint Owl Lamp. Photo courtesy of James D. Julia Inc.
Pairpoint actually started out making silver plated items at their New Bedford, Mass. factory in 1880. When they merged with Mt. Washington Glass of Boston in the late 1880s, they began making lamps fitted with colorful and fancy reverse painted shades thereafter. Collectors relish finding Pairpoint “Puffy” lamps today. The name comes from the blown out shades with reverse painting sitting on quality metal bases. The shape of the shade and the way it is decorated decoration determines the popularity and value of a Pairpoint lamp. Most Pairpoint lamps sell in the $1,000 to $25,000 range. Some rare examples can soar much higher though. The Owl lamp, one of the most popular styles with collectors, can sell for $60,000 to $80,000. The example depicted here, which has an amazing base as well as a captivating Puffy shade, sold for $77,025 at James D. Julia Auctioneers in 2013. Like many antiques with high values, these Owl lamps have been reproduced. Handel of Meriden, Connecticut was another company making lamped with reverse painted shades beginning in the late 1800s. While they did make leaded glass lamps, they were in competition with companies like Pairpoint for the most part making examples with reverse painted shades. Some Handel lamps with reverse painted landscape, Aquarium, and other unusually decorated shades sell for up to $85,000, but most are valued in the $3,000 to $20,000 range. Handel also made what were deemed “Teroca” shades. These were made most often with slag glass, and they can be found in a variety of colors with metal overlays in varying patterns. While Handel wasn’t the only company making this type of metal overlay shade around 1900, theirs are some of the best. It’s also interesting to note that Handel didn’t start making metal lamp bases to go with their beautiful shades until 1902. Prior to that time, customers could provide their own bases and have shades fitted to them. This means that a very valuable Handel shade can be found on another type of base. It doesn’t hurt the value, however, to find both a Handel shade and base together.